Ravel "Tzigane" Rhapsody Susanna Gregorian Susanna Gregorian photographed by VERNAKES in Valencia, Spain, 2012-2013. 19:30 Recital of Violin and Piano with works of Beethoven, Verdi, Alard, Arutiunian, Khachaturian and Prokofiev. At Palau de La Música, Valencia, Rodrigo concert Hall. With Ruben Sanchez Vieco on Piano. 20:00 Chamber concert with Brandenburg Concerts Nr. 1 in F, Nr. 2 in F and Nr. 3 in G. With director / violinist Fabio Biondi and chamber ensemble of “Palau les Arts“, Los Toros Hall, Palau les Arts. 21:00 Violin recital with pieces and sonatas of W. A. Mozart to celebrate Mozart’s birthday. In theater “Martin y Soler” of Palau les Arts, Valencia. 20:30 Participation in "Recital D'Estreles" and chamber concerts at the IX International Chamber music festival 6-16 July in Godella, Teatro Capitolio, Spain. With popular works of Armenian composers and Juan Carlos Garvayo on piano / klavier. 20:00 Violin recital "Welcome to Summer" at the Cafe Mercedes Jazz, Valencia / Calle Sueca 27. Pieces by Vivaldi, Paganini, Manuel de Falla, Korsakov, Gershwin and Piazzolla. With Husan Park on piano. 20:00 Violin recital " La Primavera" at the Cafe Mercedes Jazz, Calle Sueca 27, Valencia -Ruzafa. With a popular program. Pieces by Vivaldi, Beethoven, Mozart, Paganini, folklore temas of Armenia, Shekherazade by Rhymsky - Korsakov and fantasía for violin La Traviata by Verdi. With Ruben Sanchez-Vieco on piano. Tickets reservation on Cafe Mercedes Jazz. Dowload PDF-flyer here. International event " Mozart Nacht und Tag " dedicated to Mozart´s birthday. Violin recital with works of Mozart and Sarasate - * Magic Flute* fantasy. Theatre Martin i Soler, Palau les Arts , Valencia, 22:00. With Ruben Sanches-Vieco on piano. Concert Duo Violin and Guitar-sing. Extraordinary program! Pieces from Beatles to Paganini, van Morrison to Vivaldi, Armenian folks... With Will McCarthy on guitar at Cafe Pessoa, Ruzafa-Valencia, Spain. 20:30. More information : interview with Susanna. Five recitals at Gala event Nit a Lesarts Reina Sofia. Works by Vivaldi, Mascagni, Verdi, Rimsky-Korsakov with Pablo Martinez on piano. 21:00 and 22:45 at Sala los Toros, Valencia. Masterclasses in ALMA International Academy in Altea , Spain - España. Intensive classes , lessons of stage art, concerts of students and professors of the academy. Application form is available at www.almaacademy.com with deadline till 30th of May 2015. Welcome to all professional levels! More information: flyer download (ES), flyer download (RU). Masterclasses of violin at CBIMA Altea - summer Academy at the Altea Conservatory (s. on Facebook at https://www.facebook.com/CBIMA.Altea) with Ramón de Andrés - voz & Adrián van Dongen - Cello. More information: flyer download (pdf). Susanna giving Masterclasses and concerts at SIM 2014 X anniversary of International Seminars of Music at the Conservatorio Profesional de Música de Valencia . With Rafal Jezierski - Cello & Carles Marin - Piano. Duo Violin and Cello at the cycle of "Las Noches Poético -Musicales de Ithaca 2014" -a Poetic Concert-evenings on ITHACA 2014 with Rafal Jezierski-Cello. Program with works by W.A. Mozart, G.F. Haendel - Halvorsen, B. Bartók, M.Ravel, R.Gliere. Fundacion ITHACA, Partida Monte Molar 78, Altea - Spain. Tickets reservations: Tel +34 96584 2350; www.point-editions.com. Concert in Alcoi, Theater Calderón, Spain. Ludwig van Beethoven. Triple concerto in C dur Op.56 for violin, cello & piano with Rafal Jezierski - cello, Carles Marin - piano. Jordi Bernácher conducting Orquestra de la Comunitat Valenciana. Mozart Sonata in B Dur KV 378, Mascagni-Intermezzo & Piazzolla - from"Historie du Tangos". 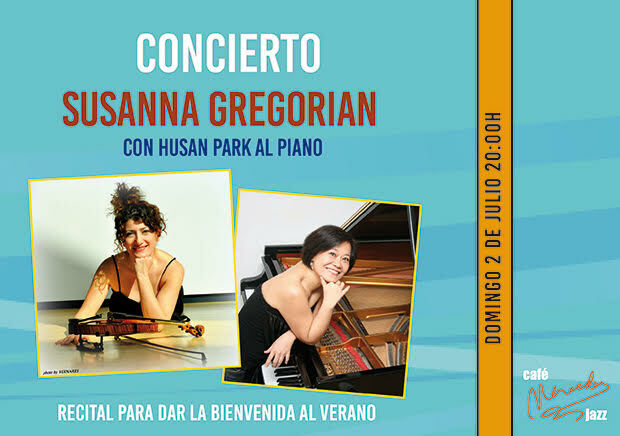 Susanna will give masterclasses and concerts at the IMFV2013 International Music Festival Valencia from 1st till 10th of July 2013. All students are welcomed to apply for participation!